This is how many of us here at Spielverlagerung describe Monaco. This match against Arsenal showed exactly why they are behind a team like Atletico Madrid in some regards. The game was defined by Monaco’s lack of vertical compactness – which is not something fans usually see from their team. Even with their poor compromising of space, Monaco were able to progress through by only losing 0-2 on the night. There were some aspects of Monaco’s defense which were impressive. They were quite organized within their lines and it was nice to see them work hard to move into their lines when defending. Usually you’ll see players really working hard when they are running after the ball and pressing – but this was different. Players were running to get into position in order to make the team more stable. What wasn’t impressive was Monaco’s lack of backwards-pressing, intensity in collective movement, vertical compactness, and their preparation for pressing moments. These are aspects in which Atletico Madrid are normally excellent – and the contrast between the two teams (in a tactical sense) is most apparent in regards to the mentioned qualities. When I say backwards-pressing, I am referring to the act of pressing once the ball has moved behind a player. For example, if the ball was played behind Berbatov and Moutinho and in front of the Monaco midfield – good backwards-pressing would see Berbatov and Moutinho running back to press the players along with the midfielders. This could also be considered a pressing trap depending on the situation. Moutinho would drop back at times to passively to force the opponent wide. A specific scene saw him in a 1 vs. 1 situation vs. Ozil in the center of the field and he quite obviously gave up the side of the field by facing his hips towards the sideline completely – blocking Ozil from moving towards the inside of the field. Monaco’s general strategy in defense was to remain in an organized and (somewhat-)compact 4-4-2 shape and congest the center – therefore forcing the ball towards the flanks where they could suffocate the Arsenal buildup against the sidelines. They were quite successful for about half an hour until Arsenal changed their positional structure in order to better exploit Monaco’s deficiencies. Monaco’s defense was basically a zonal-man marking scheme. Meaning they played zonal defense and shifted with the ball, but when an opponent moved into a specific Monaco player’s zone – the Monaco player would then man mark the Arsenal player until he left the defensive zone. 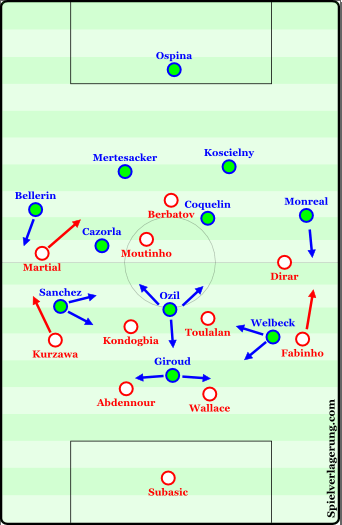 They defended more aggressively in the center of the field but were quite passive on the flanks – Monaco seemed happy to just keep Arsenal wide and let them struggle to create in the tight areas rather than actively seeking to press and tackle them. The most glaring problem during the match was how easily Monaco was drawn out to press. Well, a part of Monaco at least. The forwards would press Arsenal when out of possession and the rest of the team wouldn’t follow up. Though at times one central midfielder would assist the forwards if one of the Arsenal players they were marking dropped deep in build-up phases near the center line of the pitch. This is because Monaco looked to mainly confront the opposition around the center of the field – defending in a mid-block. Combining the lack of vertical pressing support with the absence of backwards-pressing left some big gaps for Arsenal to exploit without any intense pressure, especially after the Gunners changed their positioning around the half-hour mark. Out of Arsenal’s two pivots it was Cazorla who was more present on the ball in possession and was more vertical than his counter-part. Ahead of them there was Ozil near Giroud and Alexis on the right flank while Welbeck was on the left flank. Against Monaco’s 4-4-2 Arsenal was having trouble with their 2-4-4 type progression in possession. Arsenal was forced wide quite easily due to the lack of presence in central midfield during build-up play – and from there they would look to move inside and combine off of Giroud in order to move into the box and score. That approach is particularly difficult because Monaco was very focused in the center and didn’t care much for the flanks. So moving outwards towards the flanks and then inside from the flanks in a higher area was made much more difficult and the progression of Arsenal’s attack stagnated there, ending in crosses or inaccurate long passes. Around the half-hour mark Arsenal changed and moved Ozil deeper while the wingers became more central. The progression looked more like a 2-3-2-3 and was much more inter-connected through the central areas. Coupled with Monaco’s defensive troubles this allowed Arsenal to move through the central areas of the pitch smoothly, combine in central areas with better synergies, and manipulate the defenders. 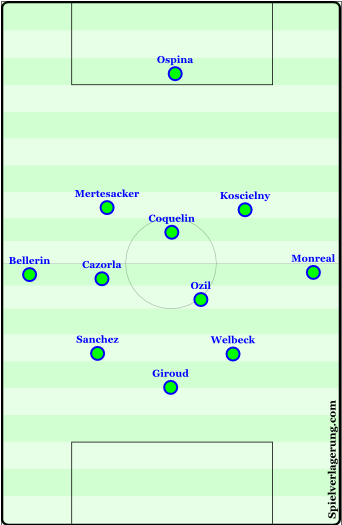 A frequent pattern in deep ball circulation after the change was Arsenal playing the ball towards one flank and then when the ball was moving back towards the center – an Arsenal player would play a sharp diagonal pass behind Monaco’s front pressing line into a teammate to turn and attack. Arsenal’s change in positional structure also meant that their counter-pressing improved due to the increased presence of players in central areas. Which ultimately lead to the Gunners dominating the rhythm of the match from slightly before their first goal until the end of the game. The most successful combinations for Arsenal came when Ozil drifted towards Cazorla and Sanchez. These 3 are arguably Arsenal’s best players in combinational play (Ozil the probable exclusion), and did well to create dangerous situations for the team. Later in the game Ramsey came on for Coquelin and Cazorla moved into the #6 role. He was actually quite impressive in this role, with intelligent positioning, great pass selection, and his usual ball retention skills. He was even compared to Busquets (in regards to offense) by my colleague – RM. Monaco’s attack focused on combinations down the flanks, where the forwards would shift. The combinations on the right flank featured a more present Berbatov while on the left the talented Martial was the dominant force. Martial received support in the form of overlaps and moved inside to dribble and cross/shoot, or to combine with Moutinho. Though this strategy was made difficult to execute due to Arsenal pressing high and aggressively in a 4-4-2 with Ozil and Giroud as the front-men. That’s the story of the second leg – Monaco were lackluster in all phases while Arsenal took time to realize what the best fit was. Once Arsenal improved they were quite dominant, enough to earn progression into the next phase of the Champions League. Monaco managed to survive though and it will be interesting to see how they perform in the Quarter-Finals after knocking out a big club like Arsenal. Hopefully Arsenal manage to stop depressing their fans with results that don’t live up to the high standards of the famous club.